Be sure to check the Safeway JustForU deals this week. You many have some Personalized Deals that work great for your needs. 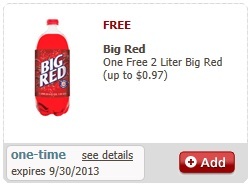 Looks like they are offering Free Big Red – One Free 2 Litter bottle. The coupon is in the Coupon Center. They also have a coupon for Free Milk with the purchase of 4 boxes of cereal.